File Converter is a personal open source project started in 2014. I have put hundreds of hours developping, refining and tuning File Converter with the goal of making the conversion and compression of files an easy task for everyone. You can help me by contributing to the project, by making a donation or just by saying thanks :). From formats: 3gp, aiff, ape, avi, bik, cda, flac, flv, m4a, mkv, mov, mp3, mp4, oga, ogg, wav, webm, wma, wmv . To formats: flac, aac, ogg, mp3, wav. From formats: 3gp, avi, bik, flv, gif, m4v, mkv, mp4, mpeg, mov, ogv, webm, wmv . To formats: webm, mkv, mp4, avi, gif . To formats: png, jpg, ico, gif . Note: If your source file is a video, the conversion to an audio format will extract the audio part of the video. 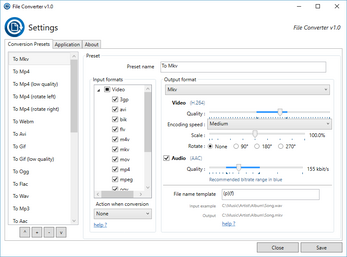 Note 2: The mkv and mp4 output file formats encodes video using H.264 encoder for video and AAC encoder for audio. 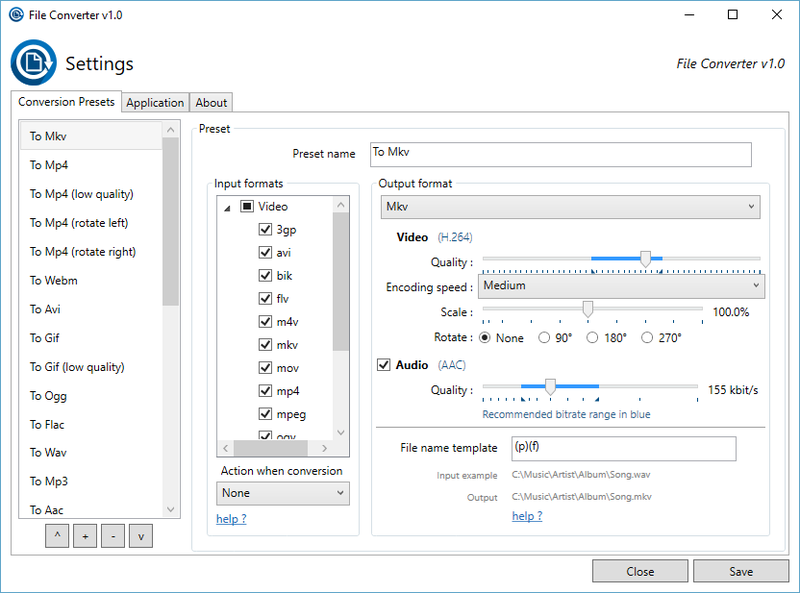 Note 3: The avi output file format encodes video using Xvid encoder for video and Mp3 encoder for audio. File Converter is licensed under the GPL version 3 License. For more information check the LICENSE.md file in your installation folder or the gnu website: http://www.gnu.org/licenses/gpl.html.